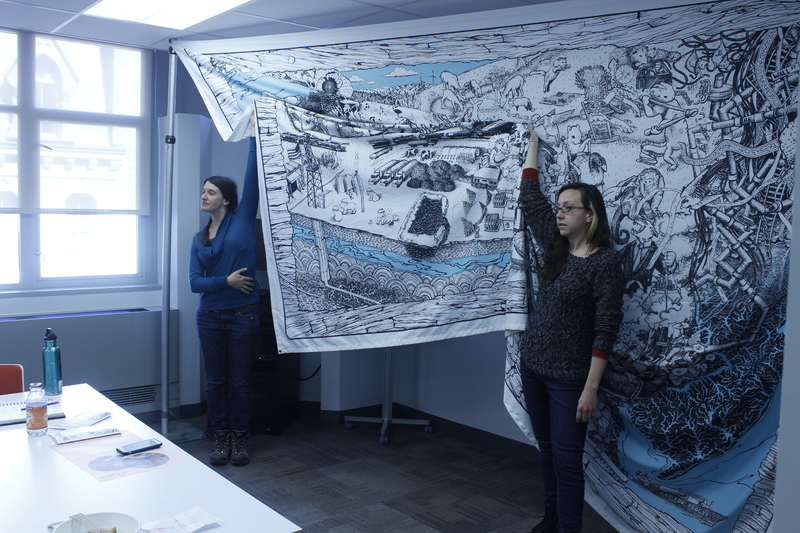 Water Ways is a collaboratively-drawn series of highly detailed pen and ink illustrations telling the story of water and the effects that the natural gas industry has on Pennsylvania, New Jersey and the surrounding area. 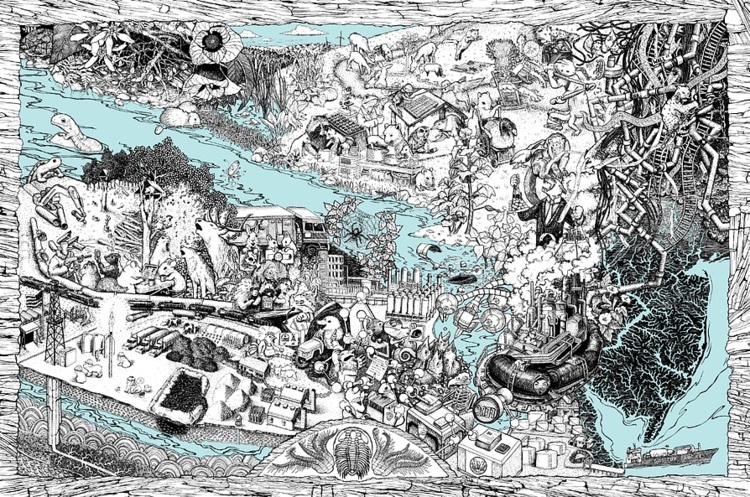 Each illustration consists of dozens of small vignettes that highlight people's struggles with companies and our own government as they strive to protect the water and land on which we all survive. Water Ways is created by Bri Barton and Meg Lemieur. Meg Lemieur: Through my art, I am interested in juxtaposing nature with the human experience while exploring the themes of social and environmental justice with a hopeful perspective and questioning sensibility. Through my work as an environmental activist over the past eight years here in Philadelphia, I have learned to use my art as both a form of expression and communication. Manifesting in illustration, performance, story sharing, and other art forms, my work continues to educate, inspire and connect communities and individuals who yearn to make the world a better place. Bri Barton is an artist, witch, plant grower, and organizer. Her work elevates and embodies racial and environmental justice, anti-imperial history, earth worship, and defiant celebrations of life. Bri graduated Valedictorian from Moore College of Art in 2011 where she double-majored in Fine Art and Curatorial Studies. 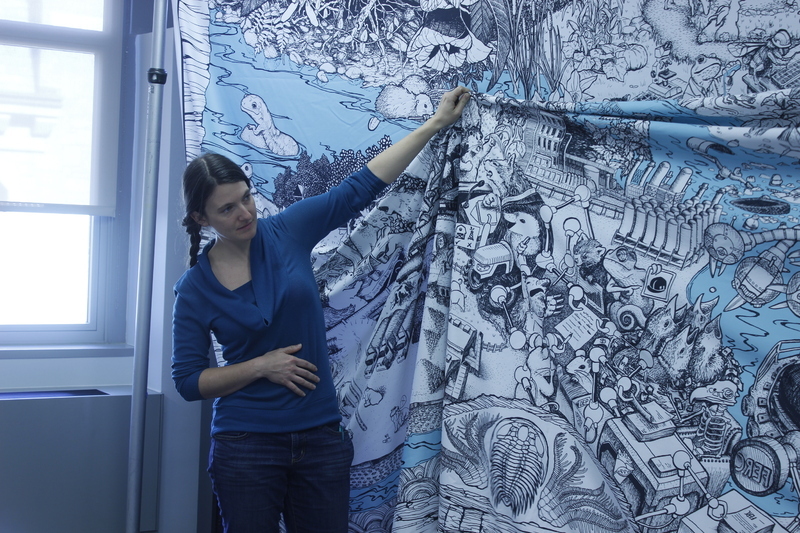 She uses paint, ink, shadows, and light to create art that is collaborative, participatory, and informative. Bri is a founding member of the multi-disciplinary painting troupe, ROMPUS. She is also a member of Soil Generation, a black-led coalition of Philadelphia organizations and individuals who support community-managed green space, gardens, and farms through advocacy, grassroots organizing, and education. 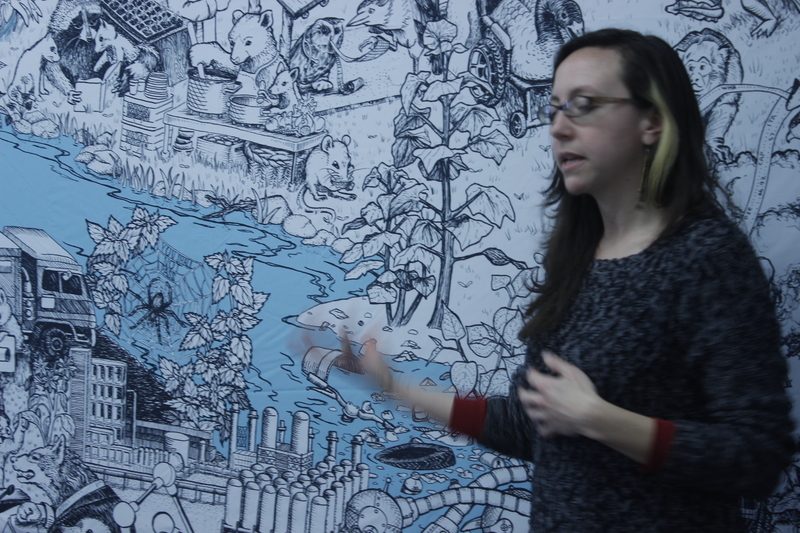 Bri is the creator of participatory projects hub, Everybody Colors, and the writer and illustrator of Everything Dies! A Coloring Book About Life!. She loves learning, teaching, climbing trees, and composting systems of oppression.